In a few days it will be March 25th. This day marks a very important day in the life of a Greek as it is Greek Independence Day. If you live in a city with a large Greek population there may be a parade to commemorate the day. Boston, Toronto, New York, all have parades where thousands line the streets and shout ZHTO H ELLADA! ZHTO H 25H MARTIOU! I remember growing up as a little girl dressed up in my Basilisa Amala outfit and being presented with a poem that I needed to memorize either on my own or with a partner to present at our Greek School program. I remember the nervousness about the room. From the kids–would we remember our lines when the time came. From the parents–would their child represent them well in front of the entire community. Somehow that two passed and I guess sparked my love for public speaking. When you’re getting up in front of a couple of hundred people at the age of six and seven, really what is a couple of thousand people when you’re in your twenties and thirties. I remember being a member of the Hellenic Society and marching in the parade when it started in Boston. I still have a favourite photo of mine with me, ready to march, and my dad, a former evzone, ready to march. I know many of you will have your Greek Flag as a temporary cover photo on Facebook this week. You’ll make sure you have your blue and white clothes on this Saturday as you represent. But what can you be doing year round to commemorate this day? Can you be teaching your children about it, more than just once a year? Can you represent by giving back to those in our community who need help, either by giving of your time or services? I know that there are many programs in Toronto for elder Greeks and even a Greek nursing home. Is there an opportunity to volunteer and make a plan to visit once a month and read to the seniors? I know in Boston (Canton actually) there is a Greek nursing home as well or what about Philoxenia House? Can you volunteer to go cook a meal for the individuals who are staying there? My point being that being Greek or rather celebrating your Greek heritage shouldn’t be a March 25th event only. It should be an everyday event. How can you use your talents and relay to the world how amazing we truly are? At a time when the world is seeing Greece as problem country with all of the debt it has, and the refugees that have fled to this country, let us show them how amazing and wonderful the people are. Let us show them that we haven’t lost our sense of philotimo and philoxenia. Let us show them that the pride that we carry in our hearts doesn’t turn off the other 364 days a year. For my non Greek speaking friends you can find a translation of the Anthem here. Well there comes a time in every person’s life where they need to go to the dentist. For some it is an amazing experience and for others it is traumatic. For some they love it and others hate it. I was trying to be aware of all of this when booking the kid’s first appointment to the dentist. Now some people take their child as a one year old to get them used to the idea, others I’ve heard wait until all the teeth are in, including molars, and then go. My personal dentist said to wait until she’s three to bring her in. So seeing as we’re almost at that milestone I decided to make an appointment for her. 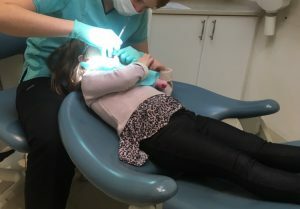 I didn’t go to the dentist that hubby and I use, I made a decision to take her to a dental office that specializes in kids. It was truly quite the experience. We walked in and the waiting room was buzzing with chatter. Kids and parents were everywhere. As I observed my child was definitely the youngest in the room. She did great while waiting and even tried to sneak into the back once or twice before she was called. As we were called and entered the back each room was decorated with a kid’s theme and we walked in and she took her seat on the big chair. She was asked what her favourite show was and before I knew it she was laid back watching Paw Patrol while we were answering some basic questions. The dental hygienist was amazing. Patient and had a kind voice which not only put my child but myself at ease. When she finished she passed it off to her ‘friend’ the dentist to double check her work. The dentist was great again making sure everyone was comfortable with everything she was doing. The hygienist came back right as we finished with a balloon and a token for a prize, since the kid had no cavities. The dentist came back with a few stickers since she had done such a great job she deserved something extra she said. All in all it was great. 1) Read as many books as you can about going to the dentist. 2) Watch as many cartoons, kid’s shows, YouTube videos, whatever your child is into that shows them going to the dentist. We watched Peppa Pig, Caillou, even the Paw Patrol go to the dentist. 3) “Practice” in advance with them. We have a doctor’s kit that includes dental instruments and so we gave her an idea of what it would be like. Find a dentist that you like or you think will be good with kids. This is trial and error. I love my dentist but did not feel that they’d be the best fit for my child, so I went elsewhere. 4) If you’re not brushing your child’s teeth start now. They are never too young to start. Also one thing I was told is if you’re not flossing start now as well. We haven’t been diligent in that department. Not for lack of trying but you attempt to corral a toddler and hold them down while holding a tiny piece of string between their teeth. One tip we were told is use the dental floss picks. Lay them down and make it a game. Certainly has been a game changer for us. Here is the little Miss, holding on to Rainbow Bear, while her teeth are being counted.